The Affordable Care Act (ACA) requires each state to have a competitive marketplace, known as an Affordable Health Insurance Exchange (Exchange), for individuals and small businesses to purchase private health insurance. All Exchanges will launch open enrollment in October 2013 with coverage becoming effective as early as Jan. 1, 2014. State-based Exchanges will not be required to perform random verification of employer-sponsored coverage until 2015. Partner with HHS so that the state is involved with the operation of the FFE. For 2014, 17 states and the District of Columbia have been conditionally approved to operate their own state-based Exchanges, seven states have been conditionally approved for partnership Exchanges, and 26 states have opted to have HHS run the Exchange in their state. 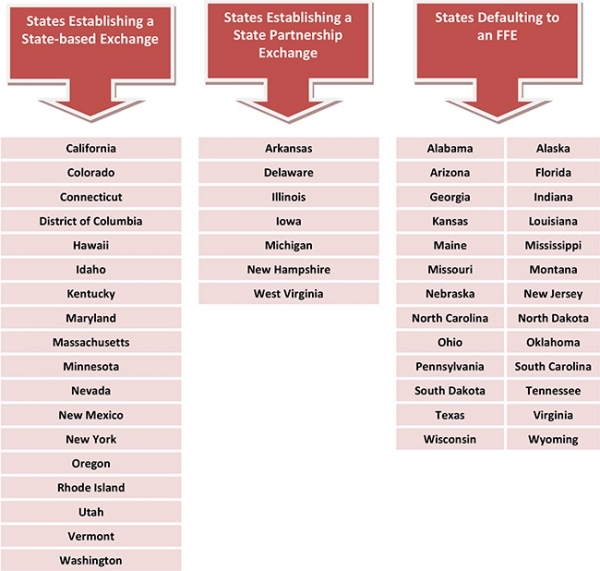 See the chart on Page 3 for information on each state's Exchange decision. Beginning in 2014, federal subsidies will be available to help individuals purchase health insurance through an Exchange. The subsidies are designed to make coverage through an Exchange more affordable by reducing out-of-pocket health care costs. There are two federal health insurance subsidies available: premium tax credits and costsharing reductions. Premium tax credits are available for individuals with income of between 100 percent and 400 percent of the federal poverty line (FPL). Reduced cost-sharing is available for individuals with lower incomes (up to 250 percent of FPL). In addition, to receive the premium assistance, a taxpayer must enroll in one or more qualified health plans (QHPs) through an Exchange. The taxpayer also cannot be eligible for minimum essential coverage (such as coverage under a government-sponsored program or an eligible employer-sponsored plan that is affordable and provides minimum value). In order to determine eligibility for health insurance subsidies, proposed rules would have required Exchanges to verify whether individuals who are applying for subsidies were eligible for (or enrolled in) employer-sponsored coverage on a random basis. In addition, the proposed rules would have required Exchanges to verify each applicant's household income. The final rule, however, allows Exchanges to rely on an applicant's attestation in most cases. Individuals who are applying for premium tax credits or cost-sharing reductions will be required to provide certain information to the Exchange about health insurance coverage provided by his or her employer. Under the final rule, the Exchange will perform a very limited verification of the individual's attestation. employer does not respond, the Exchange will rely on the applicant's attestation. The final rule provides that HHS will offer to perform this verification procedure for states that are establishing a state-based Exchange, but will not be able to do so until 2015. As a result, these states will not be required to randomly verify employer-sponsored coverage until 2015. Under the final rule, the Exchange will verify each applicant's claimed income against tax and Social Security records. If records show that an applicant's income is lower than what he or she claimed, the applicant's attestation will be accepted. If records show that the applicant's income is greater than his or her claimed income by a "significant amount," the Exchange will be required to verify the attestation. In 2014 only, the final rule allows Exchanges to perform random checks, instead of comprehensive verification, in cases where an applicant claims a decrease in income and verifying electronic information is not readily available. The Exchange can accept attestations from applicants who are not part of the random sample. Additionally, if electronic information is unavailable for more than 24 hours after an application, the final rule allows the Exchange to determine eligibility based on information provided by the applicant, subject to further verification. According to HHS, this transition rule is available for 2014 only because more and better data is expected to be available in future years. For 2014, 17 states and the District of Columbia have been conditionally approved to operate their own state-based Exchanges, seven states have been conditionally approved for partnership Exchanges, and 26 states have opted to have HHS run the Exchange in their state.